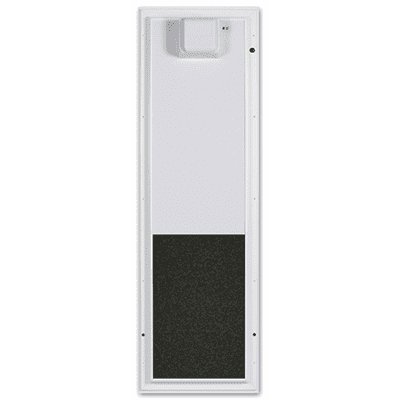 The PlexiDor Electronic Pet Door has a composite panel that slides up and down like a miniature garage door. 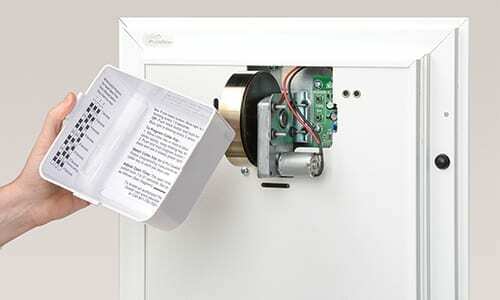 When inactive, the panel acts as a security door. 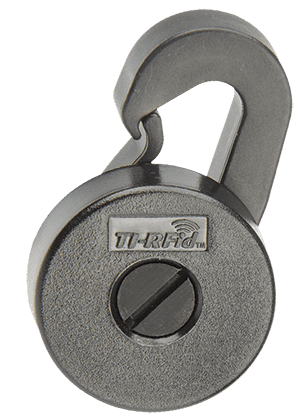 Using state-of-the art RFID technology, the sensor reads the pre-programmed code to automatically open and close only for pets equipped with a programmed collar key. Other animals have to stay outside. The collar key is waterproof and weighs only 0.4 ounces. It snaps onto the pet’s collar. 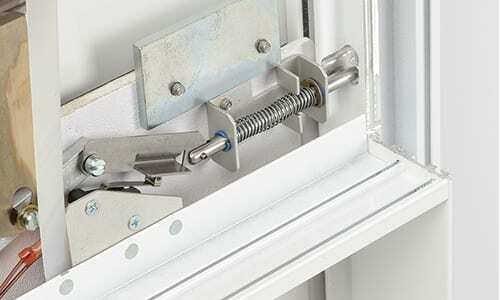 The door can be adjusted to control how long the panel stays open. The PlexiDor electronic plugs into a standard household power outlet or can be hardwired. It is easy to program and even easier to use. 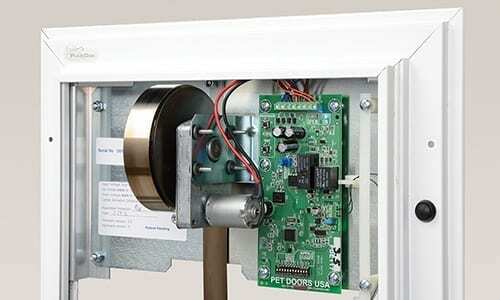 PlexiDor Electronic pet doors come with a 5 Year Warranty. 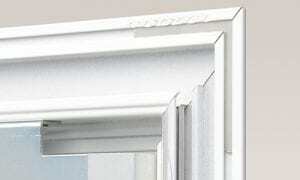 Our saloon-style Door Series and Wall Series pet doors feature a 10 Year Warranty. 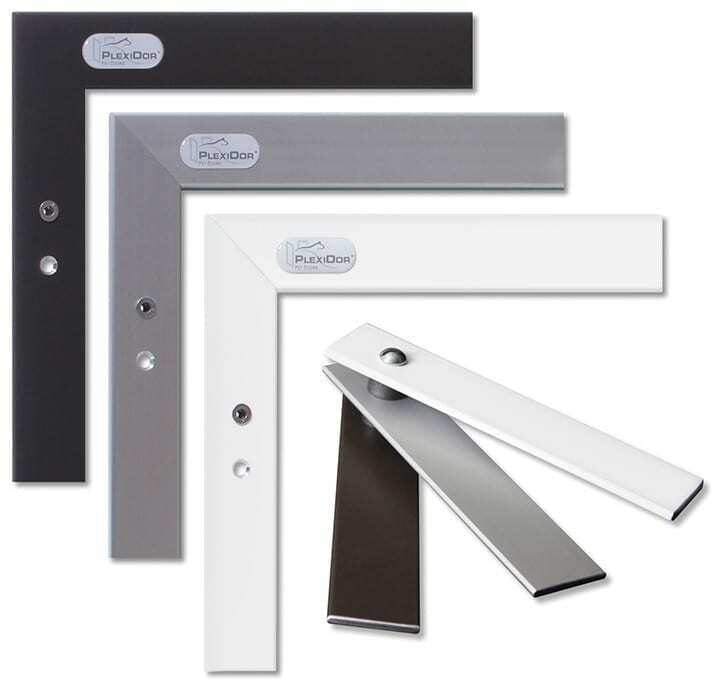 All PlexiDor pet door products include a 90 Day Money Back Guarantee. For more information or for answers to your questions about PlexiDor products, please call our Customer Service at: 1-800-749-9609. We have had our electronic door for more than 10 years. Its installation followed the intrusion of a bear into our house through our old X-large dog door. 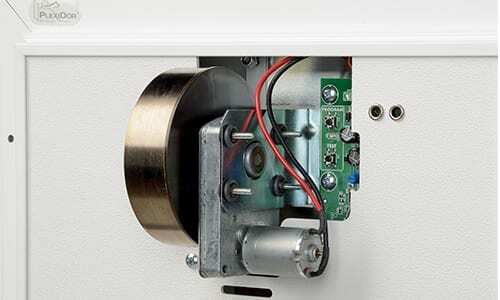 The electronic door totally eliminates that problem because of the collar key entry. The door works phenomenally well. Frankly, with two very active Labs bursting through the door at least 25 to 50 times a day, it is amazing that it has shown the durability it has. This is not to say that we have not had problems but the door technology has improved over that time. What has been most impressive is the Customer Service, notably from Bill Zahn whom I worked with on numerous occasions. Not only has he been great in walking me through things to check and adjust, but he has sent me numerous parts over the years, and many at no cost. This is an outstanding product with a strong support team behind it. This is an AWESOME dog door solution. 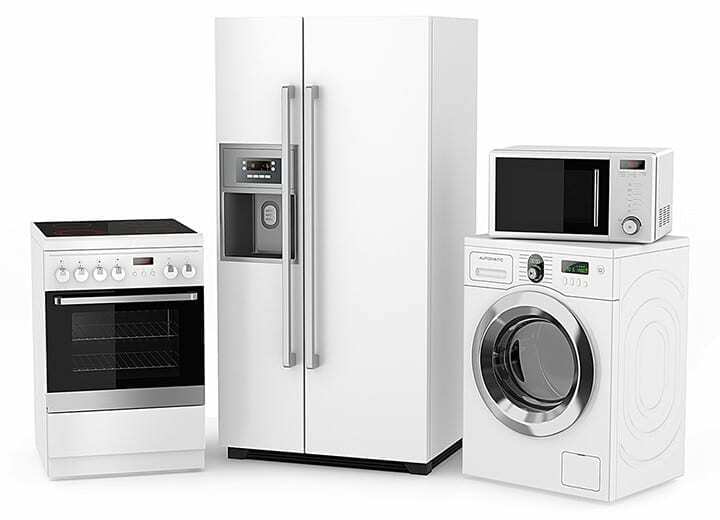 We purchased ours in 2011 and it works great. INSTALLATION: I’m not handy so we had a carpenter install the door. It wasn’t a problem for him. We live in an old house so rather than cut the original 1920 door, we bought a door from Home Depot. 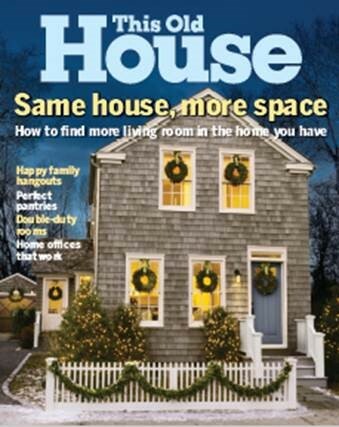 TRAINING OUR DOGS:: It didn’t take long for our dog to learn how to exit the house and reenter the house. WHY I LIKE IT; Versus a flappy cheap plastic door…this has two major advantages (1). More secure. For a large door, a flappy door can be easily broken into (just crawl in!) where this door would require force and would set up an alarm, and (2). Very weatherproof. The seal is tight, so hot air (summer) and cold air (winter) doesn’t continuously lead in. So there is a comfort and a cost savings factor. DURABILITY: In 7 years (Our dog uses the door about 5x a day, so that is about 13,000 up/downs!) we have had 3 issues. The incredible customer service person (Deidre, who has worked there for about 20 years) is extremely knowledgeable. She walked us through one problem in less that 5 minutes. She helped us fix another problem which took about 20 minutes. And the third issue required a new circuit board which under warranty was free (and out of warranty about $80) and once we received it, took about 15 minutes to install. My wife and I used to work at Purina for 17 years and 12 years respectively, so we know alot about dogs and cats. Our jusdgement is this door, although costly up front, is very well worth it. Don’t know the life of the door, but I would expect it to be longer than the 7 years we have had it. So if it good for 15 years, it costs about $120/year. We lover our electronic plexidoor. We have had it since 2008 when it first came out. Pet doors USA has been great about helping us fix minor issues and it is still working great after 9 years. The dogs love it as well. We are currently training our pig to use it! My electronic door has been working great for 3 years, but one of the keys stopped working one day. It looked undamaged, but the other key worked fine and the door tested perfectly. Customer service was great!! No third degree, they just sent me a replacement key under warranty, shipping fast. iT’S A PLEASURE TO WORK WITH A COMPANY THAT MAKES A GREAT PRODUCT AND STANDS BEHIND IT!! !